I'm going to be spending my one year wedding anniversary away from my husband next weekend and we're both not super thrilled about the whole thing. I surprised him by changing my last name to his and he surprised me with a fun new toy that I've been wanting for a long time. It was waiting for me when I got home from work today along with varieties of film and fun accessories. Oh he loves me so. 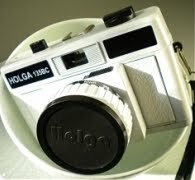 Even though my travels to San Francisco are bitter-sweet, I can't wait to try my new Holga there. I love you, Ben and plan to bring you home pretty pictures and lots of kisses.